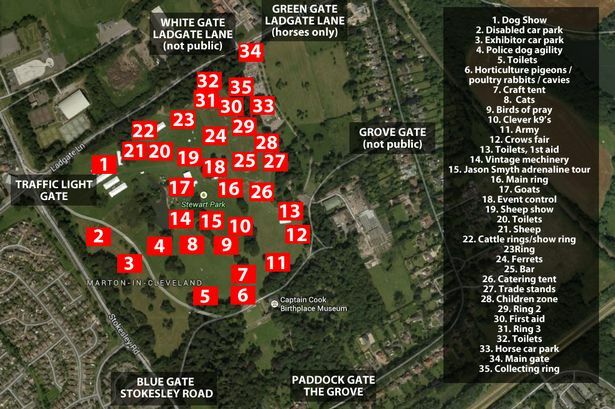 This year the Cleveland Show will be held on Saturday 26th July, 2014 at Stewart Park, Marton, Middlesbrough. Back by popular demand are the Jamie Squibb International Stunt Team, the Sheep Show and Ben Potter Birds of Prey Display team featuring eagles and vultures. Children's Fun Entertainment Centre, run by Parkway Day Nursery. Featuring Marko's Circus Workshop, Pats Puppets Punch & Judy, Krafty Kritters, fun, games and competitions. All usual large and small breed classes - horses, cattle, sheep, goats, rabbits, pigeons, rats, poultry etc. Schedules will be on this website and available at the end of April 2014. Cleveland Show started life as a Stockton Show in 1944 and was held in Ropner Park, Stockton. It moved to Wynyard Park before moving to its present site at Stewart Park, Marton in 1963 when it joined Middlesbrough Horticultural Society and became the Teesside Show. It kept this name until 1974 when with the newly formed Cleveland County it became the Cleveland County Show. The format of the show has changed very little over the years with classes for horses, cattle, sheep, pigs, farm produce, rabbits, pigeons, dogs, horticulture, honey and homecraft all included from the very beginning. Over the years, some things have changed. We no longer have a pig section or farm produce but we now have a vintage machinery section, cats, rats, mice and ferrets. There is now a large craft fair. The trade stands have increased and we have funfair rides for the children. Cleveland show is run entirely by a committee of unpaid volunteers and is self-funded. All the sections are run by volunteers without whose support we would be unable to hold the show. During the 62 years there has been a show, there have only been three secretaries and we have been blessed with much sunshine. With continued support of the people of Middlesbrough who attend and the support of exhibitors from the Cleveland area we hope to continue to have many more shows.